What do we want the future of translation to be, and how do we guide it to that place? 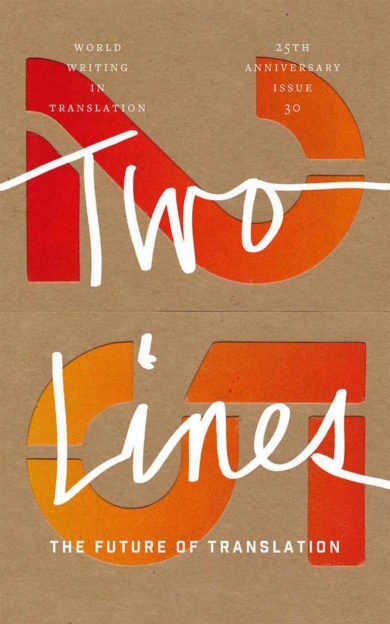 For this, our twenty-fifth anniversary issue of Two Lines, we invited six essayists and translators to wrestle with the future. For the most part, the questions are not new: Who gets translated, who does the translating, and what does “honoring” the original really mean? But the viewpoints and insights in this issue, I think, would have been unlikely even ten years ago. Bonnie Chau, a second-generation Chinese American who had purposefully turned from her family’s cultural history to be more “American,” struggles in her essay with whether she even has the authority to translate from Chinese and what sort of “American” she is actually translating for. Madhu Kaza, in her essay, discusses her struggle not only to get literature from Telugu—a language with more speakers than Italian—published, but even to find access to study the language of her childhood in the United States. And ultimately, she discusses how broadening our idea of literature can give us clarity in unfamiliar (to Americans) political times. I have been with Two Lines since Issue 16—half of the issues in the magazine’s history. I don’t know the future of translation, but I do know and am thankful that it will include new voices, like some of the translators in this very issue, and new perspectives on what translation looks like, what editing translation looks like, and what work gets published. As I think of how far literature in translation has come since Two Lines began in the early nineties, I’m incredibly optimistic about the complexity, diversity, and breadth of the art form’s future. Translation is an invitation, a bringing in of a reader who would be otherwise left outside. In the next twenty-five years I hope there will be many more homes we can be brought into, many more voices we can hear, and more translators, editors, and publishers supporting the bulky, beautiful machinery required to sit alone in a room and hear a voice speak to you alone from far away. Every Day I'm a Firefly | If You Say | "If a life springs within you..." | "Here the dead don't just go to the grave peacefully..."
"When I have heard the empty rooms in houses..." | "This evening's gentle high, a blue Diana..."
"When I have heard the empty rooms of dwellings..." | "This evenings writes euphoria's blue Diana..."